What would it mean for the novel to take a stance? To position itself relative to the world? How would it do so and how might we understand this positioning? At the individual level, we can imagine how certain novels are written from a particular orientation to the world, from “below” as in the case of Notes from Underground, or “above” (Cloud Atlas), “on” (On the Road), or even “along,” as in “along the river” (Huckleberry Finn). Prepositions begin to tell us how novels aren’t just mirrors of the worlds around them, but have a distinct location. Prepositions tend to be those words that we think have little meaning. Like other small words — conjunctions and articles come to mind — prepositions seem to serve a purpose more than anything else. We often refer to them as “function” words. Occasionally, we just need them. But they can also begin to accumulate, to add up to an overall orientation. Prepositions don’t just serve a purpose, but can also make a point. These are some of the questions I started with when I began to investigate prepositions in the novel over the last two centuries. What kinds of “positional communities” might we find when we look at novels that tend to use certain types of prepositions in higher than average amounts? And could we discern any larger changes over time in how novels position themselves vis a vis the world? I began with the assumption that there should be no large historical shifts in the positional orientation of the novel. My assumption was that novels could talk about all sorts of relationships (above, below, through, near, far, among, within, etc) and that any single orientation would get drowned out in the overall proliferation. Prepositions comprise roughly 12% of all words in a novel, which to put it in perspective, means about 14,000 words in a novel like Pride and Prejudice. It seemed unlikely that this might add-up to some kind of spatial bias or that such bias might change distinctly over time. As far as I can tell, I was wrong. 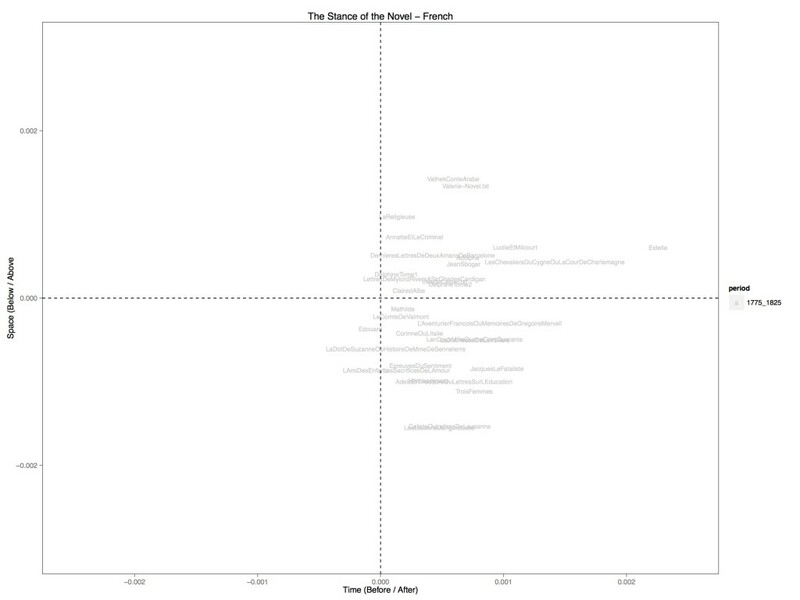 Below is a time / space graph of the novel over two centuries. 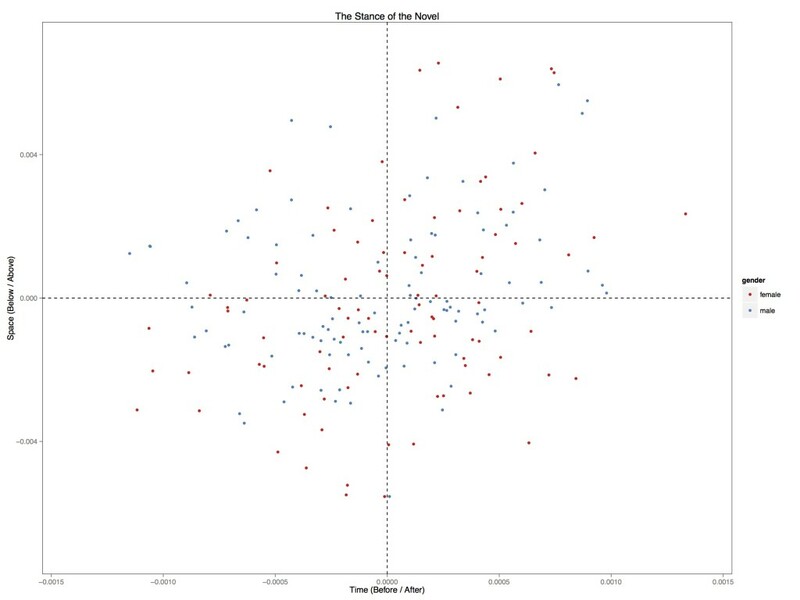 The further right a novel is the more it tends to use words like ahead, beyond, next, after and toward instead of before, behind, and back. The further up the more it favours words like above, up, on, and over instead of below, beneath, down, and under. Prepositions are famously polysemous, and some of these words are not always used as prepositions. But I think the value of thinking at scale is the way in aggregation they can begin to show us a larger sense of orientation beyond any specific single use. As we can see, there does appear to be an overall shift from the nineteenth-century (grey) to the late twentieth (black) that moves from the lower left quadrant (below and behind) towards the upper right (after and above). 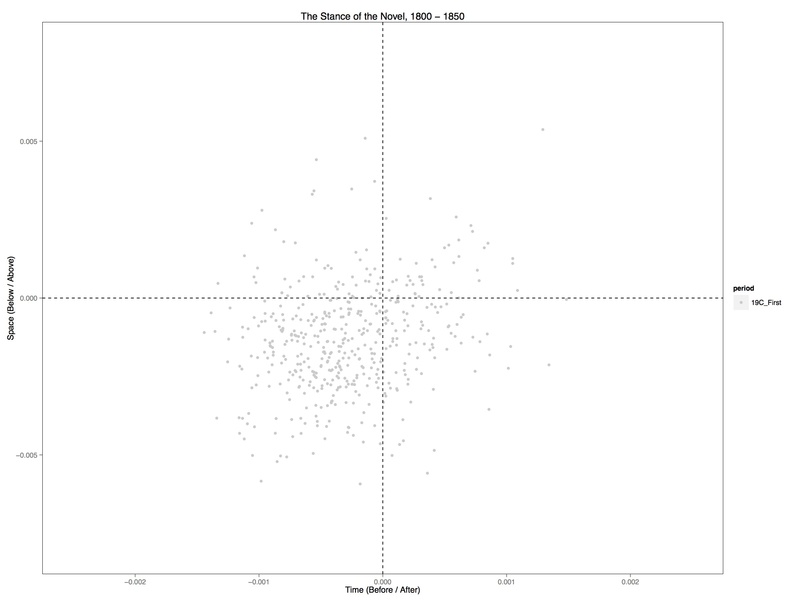 Ratio of time / space prepositions in 3000 U.S. novels from 1790 to 1990. To illustrate just how stark this shift is, I include just novels from the first half of the nineteenth century and then those published after the second world war. 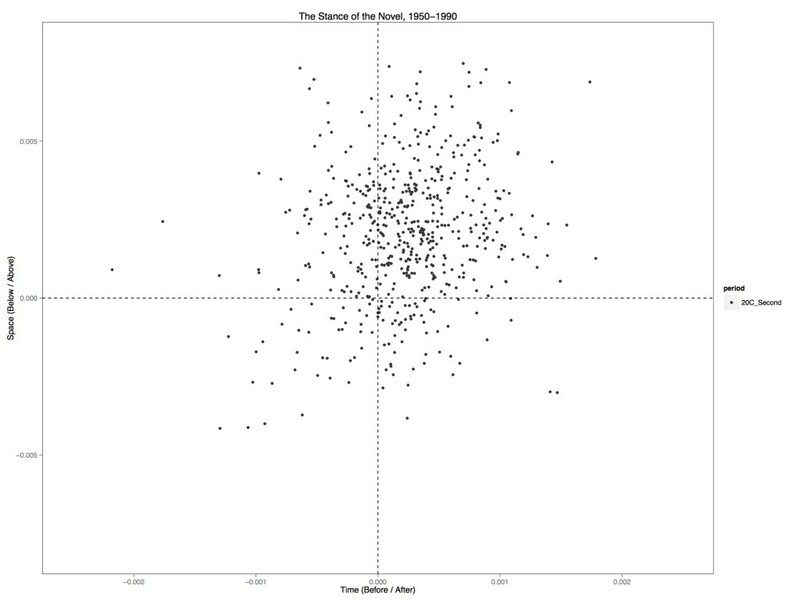 Ratio of time / space prepositions in novels published between 1800 and 1850. 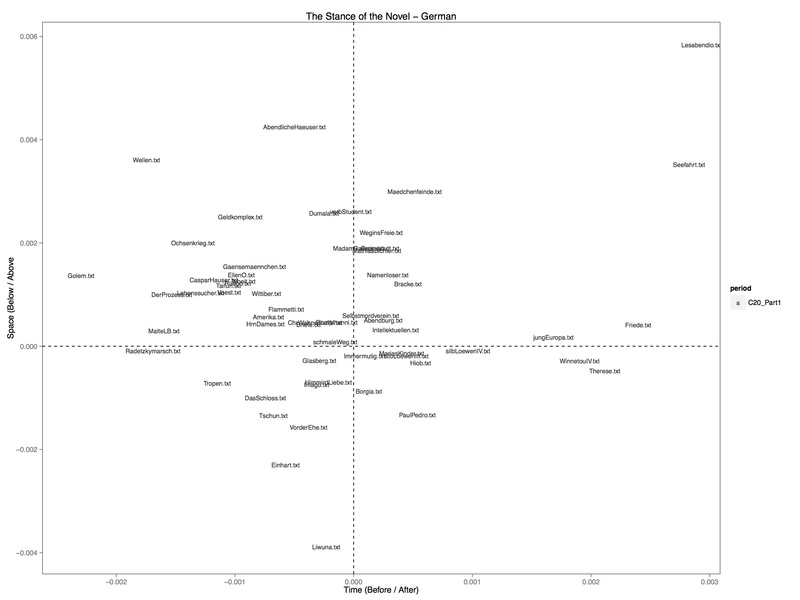 Ratio of time / space prepositions in postwar novels in English. While I do not yet have gender information about all novels in this data set, for a smaller subset of 200 canonical novels published between 1770 and 2000, we see how this shift does not seem to have any significance for the way men and women use these prepositions. This is an interesting finding in light of the ways we might have assumptions about women’s marginal authorial status translating into a particular orientation to the world. 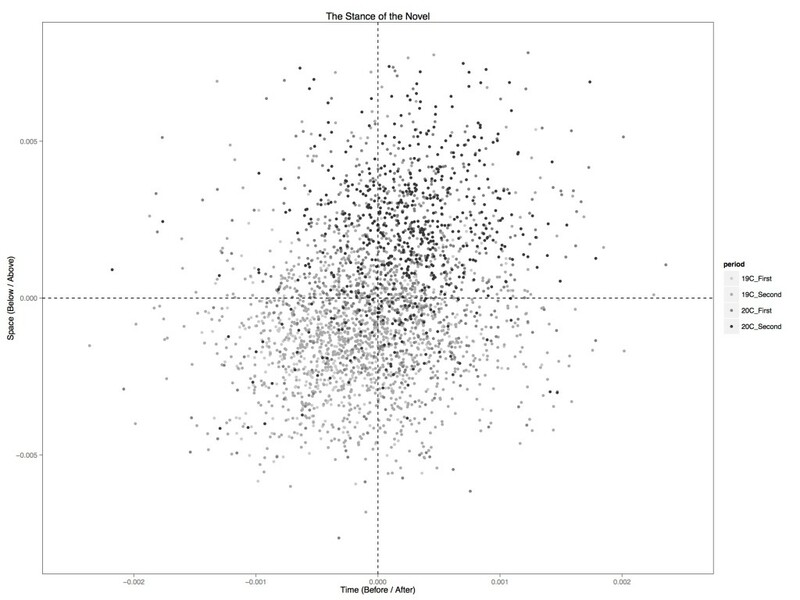 Ratio of time / space words in 200 English-novels from the late eighteenth-century to the end of the twentieth colour-coded by gender (red = women, blue = men). It is also important to note that when we look at other languages we see some differences, both small and large. The caveat is that these data sets are considerably smaller (on the order of 150 to 300 novels) so need to be taken with caution. Nonetheless, given that the canonical English-language novels follow the same path as the larger collection of English novels, it is not unreasonable to assume that this would be the case for German and French. As we see with the German novel, the move is less bi-axial (right and up) and more one from below to above. In addition, the significance of that shift seems much less pronounced (p-values to come). Though again, for now my German novels stop in the 1930s and thus the postwar shift is unaccounted for. In the French novel, the phenomenon appears to move in reverse! Novels written around 1800 tend to be more forward-looking and those written during the modernist period orient backwards. The question is whether this might look different with more data, or whether this reflects a distinctly different cultural sensibility. 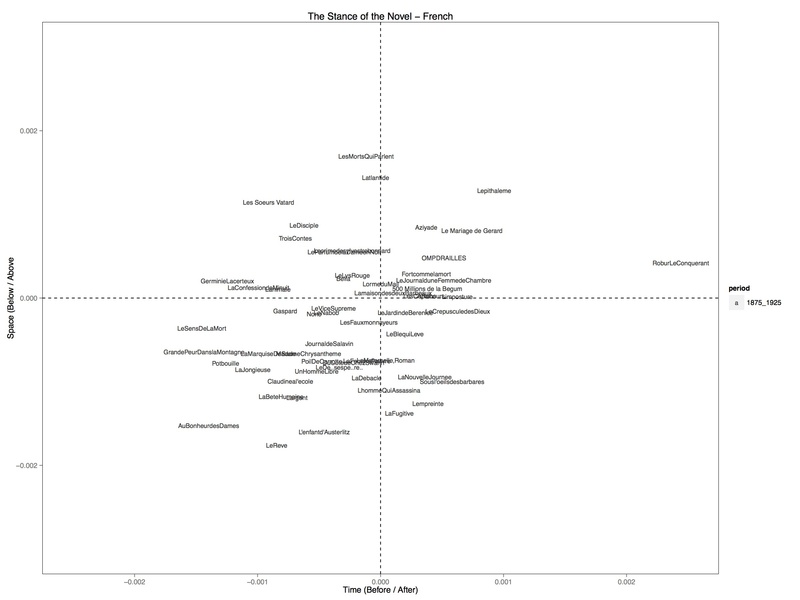 The anglo-american novel looks forward and upward over time, while the French novel moves back and down and the German hovers somewhat ambiguously in between? Are these reflective of cultural stances, effects of the different samples, or potential flaws in the model? Emily, often as she travelled among the clouds, watched in silent awe their billowy surges rolling below; sometimes, wholly closing upon the scene, they appeared like a world of chaos, and, at others, spreading thinly, they opened and admitted partial catches of the landscape—the torrent, whose astounding roar had never failed, tumbling down the rocky chasm, huge cliffs white with snow, or the dark summits of the pine forests, that stretched mid-way down the mountains. But who may describe her rapture, when, having passed through a sea of vapour, she caught a first view of Italy. As I said above, we can see how these words can mean different kinds of things in specific contexts (“over” is a great case of a word that can be used in numerous different ways and entire books have been written by linguists to study it). But taken together, these novels begin to orient our minds in a specific direction, one that is both positionally different than Radcliffe and the Romantic novel as well as attitudinally different. Ideology follows orientation, or as Kenneth Burke liked to point out, ideas have a dramatic structure — his famous scene/act ratio suggests that specific thoughts need specific spaces. Prepositions (and adverbs) can give us a sense of relational space, and thus of the types of ideas that can be possible within novelistic writing. At any given moment, a novel may turn us down or up or back or forward. But when it does so passage after passage, again and again in a particular direction, this is saying something about how narrative is relating readers to the world. 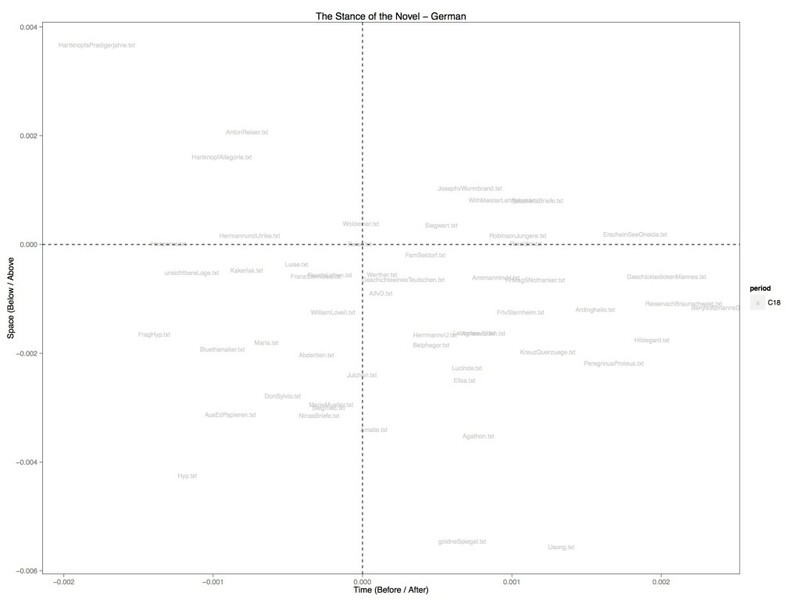 The question becomes, Can we understand the spectrum of ideas that correspond to the novel’s stance? This is the question I would like to follow next in more detail.